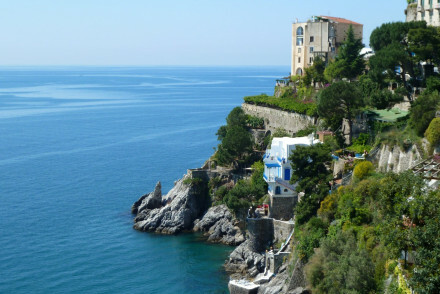 Easily accessible from Naples airport - and reached via a thrillingly winding cliffside road - this fifty mile stretch of coastline is just littered with beautiful towns and resorts, so it can be very, very difficult deciding on the best places to stay on the Amalfi Coast. The beauty of the Amalfi Coast is legendary. Elegant, colourful towns cling to steep hillsides with postcard perfection. Crenelated lines of cliffs sheer down into glittering seas via promising coves and the green hilltops are scented with lemon. As well the the legendary beauty, the Amalfi Coast is also home to some beautiful legends - namely the Sirens of Homer's 'Odyssey'. And why would these ladies of surpassingly loveliness choose to live anywhere but under these clear, bright blue skies and pretty harbours. Where to stay - which town/village? while polished hilltop charmer, Ravello has both the views and the famous literary credentials. 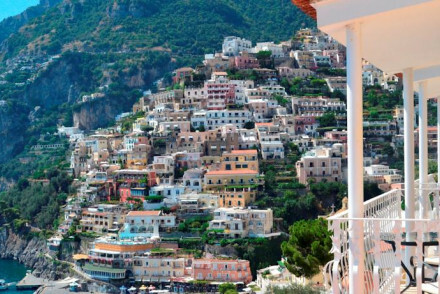 Amalfi itself is a delight with white-washed alleyways, flower-filled balconies and a sandy beach. 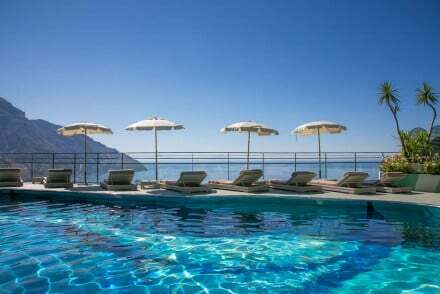 Don't forget that this is a hugely popular region, so if you want to bag one of the best places to stay in the Amalfi Coast, you'll have get organised and book well ahead. 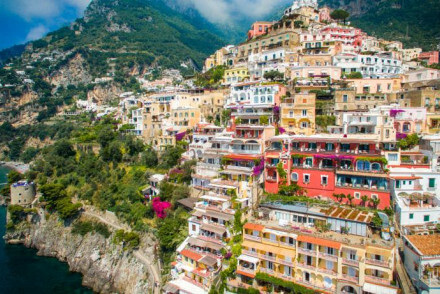 Location scouts go weak at the knees when they round the bend in the Amalfi Coast road and spy Positano nestled in the cliffs, rising like a staircase from the bright blue sea towards the citrus and olive groves. Positano's unbleached peach and pink buildings are stacked so neatly with windows poking above the buildings in front that there are plenty of properties with exquisite views. Some of the best views are of the town itself. Built atop a hill, the Villa Franca has truly sublime views of Positano and beyond, especially from the private balconies and the rooftop terrace and swimming pool. The Villa Magia is a superb six room boutique hotel with stunning views and tasteful artwork. The rest of the decor is simple and elegant and there are some lovey antiques. There is a lovely pool and spa. The Marincanto offers views with added chic. A smart, boutique feel, pale decor and an infinity pool which seems to merge with the sea. The centrally located Palazzo Murat has been converted from a 17th Century townhouse and is a romantic, luxurious, bougainvillea strewn option. 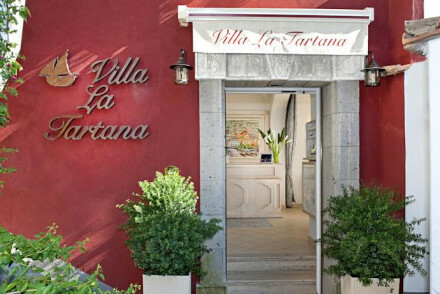 Villa La Tartana is perfect if you prefer a small hotel There are just ten rooms and one family sized apartment and the proportions are generous, just like the breakfasts served on the terrace. Miramare is another good choice for families - though you need a head for heights - the private beach is 210 steps below the glassed-in breakfast terrace. Wagner, D.H. Lawrence, Virginia Woolf and Gore Vidal all spent time here, and they're not the only people to argue that Ravello's views of the coastline are the best on the coast. This is a green and leafy town with an other-worldly romantic atmosphere. The light and architecture have ensured that it's a popular spot with artists as well as writers. 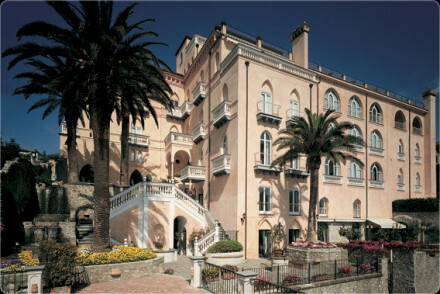 The Palazzo Avino oozes 1930s Italian film star glamour. Perched on a cliff overlooking fishing villages and pretty bays. This hotel is five star luxury from the two Michelin starred restaurant to the open air gym. This is a once in a lifetime place to stay. Villa Maria is also a good spot for foodies, view-lovers and romantics. High end but more laid back, they even run cooking classes. Ravello is know for the gardens and Villa Cimbrone adds to this fame with a beautiful botanical garden which sprawls towards the cliff face. Inside the design is stylish and romantic. Il San Pietro di Positano is spectacular. Five stars worth of vaulted-ceilings, private beach, private balcony, gorgeous infinity pool and sumptuous rooms. All with a view, of course. 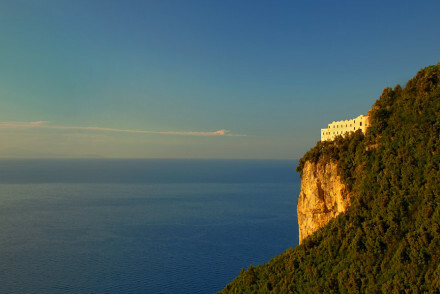 Converted from a monastery, there's nothing monastic about Monastero Santa Rosa Hotel & Spa now. The celestial views from its perch on a cliff top are to die for and the hotel captures the essence of "la dolce vita" with its location, understated but immaculate style and incredible spa facilities. Hotel Santa Caterina in Amalfi is luxury in a stunning spot with a private beach reached by a glass lift with travels through the cliff face! 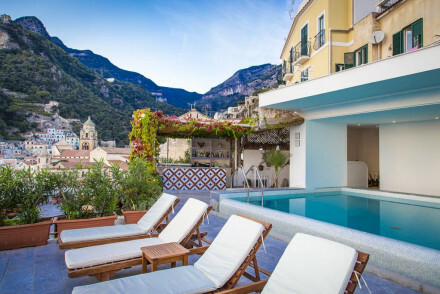 Le Sirenuse in Positano is an 18th Century palazzo turned family run hotel with a Michelin starred restaurant and a collection of beautiful balconies and terraces. 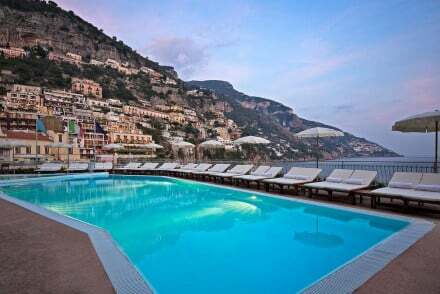 The Villa Treville is just along the coast from Positano and is a 15 suite hotel converted from an opulent estate property. There are plenty of ornate tiles and marble and a private beach, perfect views and the feeling off being the guest in someone’s beautiful home. Perfect for anyone who can afford it, the beautiful Bell Epoque era Grand Hotel Excelsior Vittoria has a fabulous spot overlooking the gulf. There are 91 rooms and suites - some of a very generous size -plenty of history and a romantic restaurant. One of the best places for families is the Grand Hotel La Medusa. It has great views of Vesuvius from the huge pool terrace and is comfortable and elegant. With rooms starting from £100 a night it's also a good option if you're on a budget. The Lidomare, just down the cliffs from Ravello is both a cosy hotel and charming family home with high ceilings, antiques and tiled floors. Rooms start at €120 per night (with the possibility of adding up to two extra beds), so this a great family beach holiday choice..
Or you might stay in one of the Villa Rosa's 12 rooms, which have some of the very best Mediterranean views imaginable from their big balconies where breakfast is served. Rooms are large and white with aquamarine tiles on the floor. Rooms start from €130 per night. Naples Airport is the nearest airport to the Amalfi Coast and from here you have a choice of travelling by car, train, bus or ferry to most of the main towns and ports we’ve mentioned. Despite summer being one of the most popular times to visit the Amalfi Coast, it’s very hot in July and August, so if you’re not just looking for a sunny stretch of sand and you have a choice about when to travel you might want to opt for May, June or September. 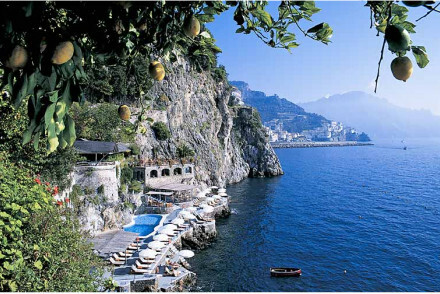 Or maybe the Most Romantic Hotels on the Amalfi Coast? 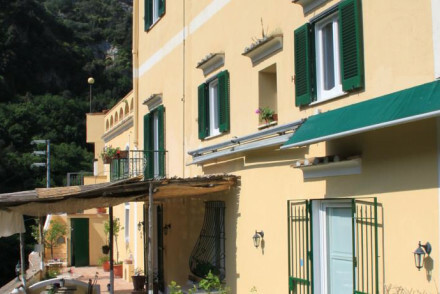 Set into the rugged Amalfi coastline with a ladder leading directly into the Tyrrhenian Sea. Mediterranean style rooms have nautical palettes and traditional blue and white tiled floors, local artworks and private balconies. There is a sunny terrace where lots of local fish and breakfast is served. Sailing - Take a boat trip to the famous archaeological site of Pompeii - not just for history buffs! Great walks - Follow in the footsteps of the gods along 'The Path of the Gods' from Agerola to Positano. Sights nearby - The Duomo (Cathedral) of Ravello houses impressive mosaics and museum. Fishing - For bluefish and tuna in the charming port town of Cetara. A chic B&B in a medieval building renovated with Italian design and furnishings. Rooms are sea facing, decorated in a traditional style and with plenty of creature comforts. Great location just behind the Cathedral. Experience the real Amalfi feel. 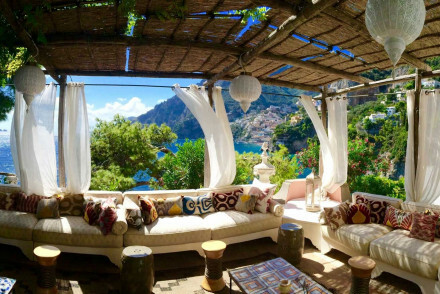 A charming little villa perched on a cliff just above Amalfi. Contemporary and simple decoration throughout, with vaulted ceilings and Majolica tiles. 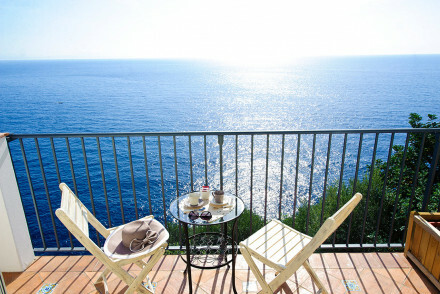 A lovely breakfast terrace with breathtaking views over the bay of Amalfi. Massages on request & within easy reach of the beach. Excellent value. 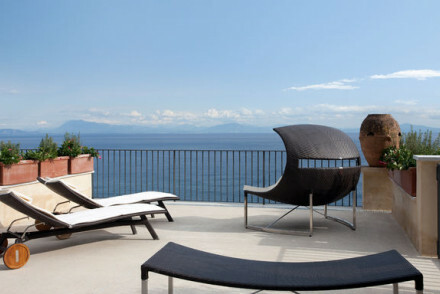 Views - Stunning views out towards the bay of Amalfi and over the town. Sights nearby - Revello, Naples, Salerno, Pompeii all within easy distances. A charming bed and breakfast with views of the historic centre. Large rooms and bathrooms elegantly decorated with ceramic tiles. Breakfast is served on the terrace with a panoramic view of the ocean. Some rooms offer a private jacuzzi. Close to the beach and some of the best restaurants in town. Ancient palace turned boutique hotel. Admire statement artworks hanging on the walls, enjoy breakfast out on the breezy terrace with the Amalfi coast for a backdrop. Elegant, romantic and artsy. A great little find. A small family-run B&B with stunning views of the sea. Chic, comfortable rooms and a sun soaked terrace to enjoy a delicious breakfast in the mornings. Located close to both the beaches and the centre of Praiano. A spectacular spot for exploring this secluded corner of the Amalfi Coast. Cosy and comfortable 16th century property provides sun-drenched outdoor terraces where guests can sit back and relax. Rooms are simple with lots of natural light. A homemade Italian breakfast is included. Open from end of March to first week of October annually, A refreshingly relaxed hotel. A cosy hotel and charming family home. Traditional high-ceilinged rooms with antiques, large bookcases, cabinets of figurines, tiled floors and white washed walls. Very well priced. A homely choice for a beach holiday. Beach Life - A two minute walk to the beach and lovely views across the Amalfi Coast from the bedrooms. Fishing - Charter a boat and head out Bluefish and Tuna fishing with some locals guides. Sights nearby - The UNESCO Heritage sight of Pompeii is in close proximity. Close by to the beach and the centre of town: a great base for exploring. Cosy and comfortable rooms with decorative bathrooms boast ocean views. Delightful little B&B, with buffet breakfast included, in its very reasonable price tag. 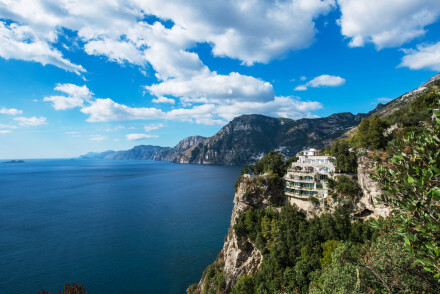 Outwardly unassuming, this cliff top hotel will surprise with its magnificent views over the Amalfi coast, secluded private beach down steep steps, and old fashioned charm. A holiday destination for serious lazing in the sun in spectacular surroundings. Views - Spectacular views out to see and down the Amalfi coast. Coastal - Set on a cliff top. 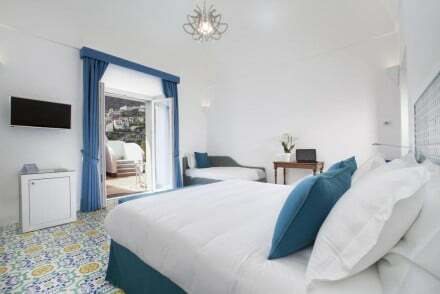 A handsome Positano townhouse with enchanting bedrooms and one apartment. Freshly decorated in whites and blues, pretty ceramic wall lights, painted bedheads and private balconies. Excellent breakfasts on the terrace. A cool sanctuary to start the day in before heading to the beach. Local exploring - Right next to the church of Santa Maria Assunta, minutes from the beach and the shorefront bars and restaurants. Sights nearby - Don't miss a trip to the World Heritage Site Pompeii. Sailing - Charter a boat to take you up the Amalfi Coast. A delightful villa featuring bougainvillea covered terraces, with unbeatable views of the Mediterranean. 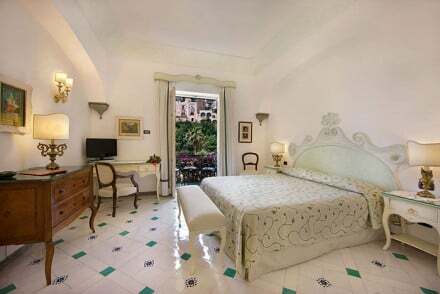 Large delightfully decorated bedrooms in white and pastels, with aquamarine tiled floors. Enormous private balconies make the perfect place for breakfast. An utterly charming spot. Total relaxation - A serene 150 year old villa, with comfortable and elegant rooms, a peaceful garden, sunny terrace and proximity to the beach. Sights nearby - Spend a day exploring Pompeii, a must see. Sailing - Take a boat trip up the Amalfi coast. 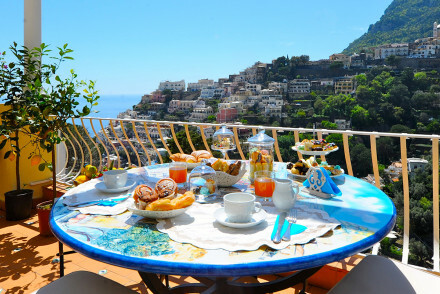 An elegant B&B offering fabulous views across Positano and the coast. A handful of individually styled rooms are traditionally dressed with polished wooden floors, crisp white linen and french doors leading onto private balconies. 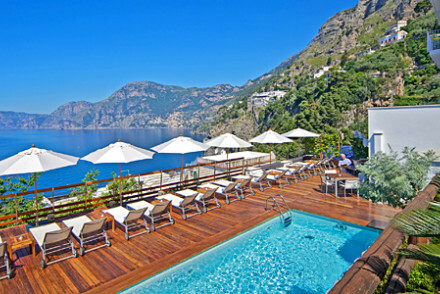 Ideally positioned for exploring Positano, the beaches and beyond. 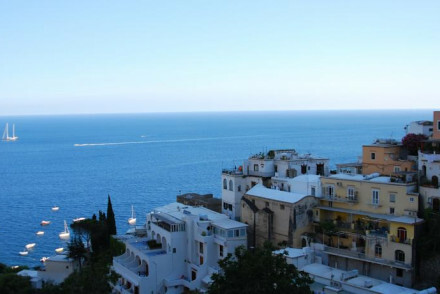 Local exploring - Ideally located to explore Positano itself along with the Amalfi Coast. Sights nearby - Discover the fascinating archeological areas of Pompeii and Herculaneum. Sailing - Rent a boat and explore the picturesque Amalfi coast. 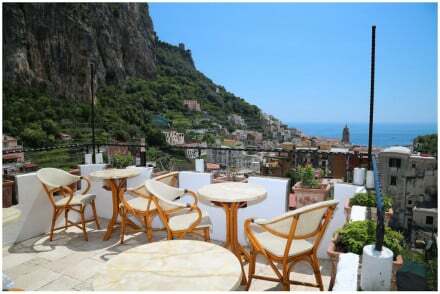 A delightful hotel set in the picturesque town of Praiano on the Amalfi coast. Rooms boast elegant, traditional decor and balconies that afford fantastic sea views. The terrace is the perfect place to enjoy a glass of wine or a delicious regional meal in the evening. A coastal charmer. Great walks - Make sure to take the Path of the Gods, a stunning walk from Agerola to Positano. Sights nearby - Immerse yourself in the rich Roman history at Pompeii. Fishing - Take a fishing trip from the port of Cetara. A boutique B&B elegantly restored from a 17th century edifice. 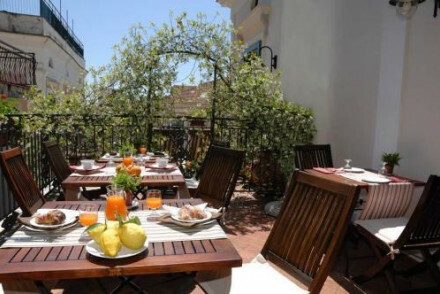 6 rooms with panoramic terraces, in the centre of town. Breakfast, cakes and pastries are served daily. Chic and stylish, a great choice for couples on a romantic break. 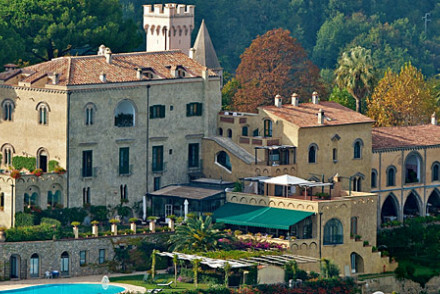 A sophisticated palazzo hotel and spa with breathtaking views of the sea. Elegant interiors are tastefully designed in soft hues and feature a mix of classic and modern design pieces. Simple rooms have a similar palette and indulgent sink-into beds. Don't miss the top-notch cuisine. A lovely 19th-century hotel in the town with great sea views from its terrace and rooftop pool. 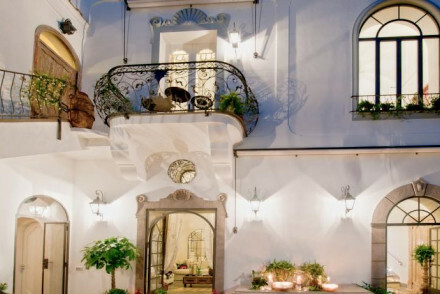 It exudes a timeless elegance with pretty archways, gently domed ceilings and potted plants. Bright rooms are chic and smart, with tiled floors and patterned furnishings. A really handy and relaxing base. 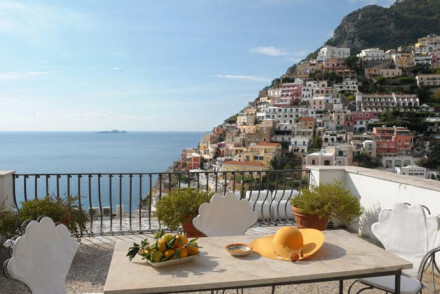 Fabulous 17th century townhouse in Positano with spectacular views. Bougainvillea strewn terraces, an infinity swimming pool, and dreamy rooms and suites with private terraces overlooking the sea. Very romantic, very centrally placed. An oasis of peace with spectacular views. The piece de resistance is the glorious dining terrace with vistas of the mountains sweeping down to a glittering sea. Fantastic food and cookery lessons using the same home-grown produce. A delightful spot for foodies and romantics. Total relaxation - An elegant coastal property with magnificent seaviews, excellent food and complete tranquility. Cooking classes - Cooking classes led by a famous professor of historical gastronomy. Sailing - Pack a picnic, rent a boat and explore the Amalfi Coast. A lovely terraced hotel with stunning views of the sea. Interiors are smart and simple, while rooms have a Mediterranean palette of sea-blue and yellows, pretty tiled floors, whitewashed walls and the small balconies benefit from those views. An easy and relaxing, sun-drenched, base. Tasteful simplicity in a stunning former convent. 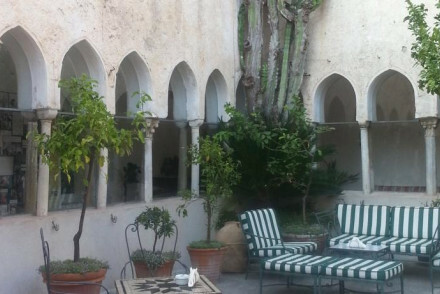 The glorious Moorish cloister is the perfect setting for a leisurely breakfast. Both restaurants serve delicious food and have spectacular views from their terraces. A romantic fairytale setting. Hideaway - A charming converted convent with rooms surrounding the ancient courtyard and wonderful views from the outdoor pool. Sailing - Guests can book a speedboat to take them on a tour of the Amalfi coast. Sights nearby - Visit the UNESCO heritage sight Pompeii. A wonderfully intimate B&B with lots of character, looking onto a pretty central square. Expect chic interiors with jazzy printed wallpapers, fun tiling and hip fittings. Rooms are bright and airy with a similar laid back yet stylish feel. Don't miss the charming bistro for breakfast and its snacks. 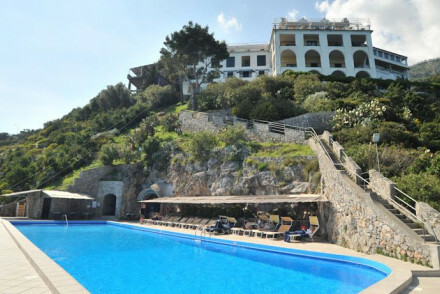 Beautiful former convent set in the rock face just above the town of Amalfi. Fabulous views of the town and sea from the terraces and the swimming pool. Chic rooms and suites with vaulted ceilings and neutral hues. Spa, restaurant and bar. Stylish minimalism at its best. Sights nearby - 10 minute walk down hill to Amalfi. Positano is 20 mins by car. 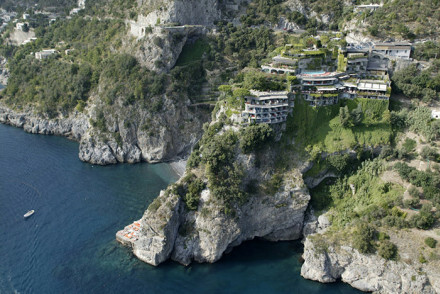 A very cool designer hotel set in the cliff face. Sleekly minimalist with white washed walls, exposed stone work, and clean lines. Rooms, suites, and separate cottages have private sea-facing balconies. Fantastic spa, restaurant and private beach. Ideal for honeymooners. Hotel boats for hire - Private skippered boat for guests. Chic and charming experience Italian village life. An intimate B&B with yellow and white décor offers air-conditioning, free wifi and breakfast. Perched on a cliffside, every room features a magnificent sea-view terrace. Some rooms come with a relaxing bath tub as well. A romantic boutique hotel in a cliff top setting with an infinity pool. Authentically decorated rooms and suites with hand-painted furniture and ceramics, four poster beds, and mezzanine levels. Fabulous orchids; exotic and botanical gardens. Oozing with Amalfi charm. Restrictions on children - No children allowed, over 18s only. A gem perched above the town with breathtaking views. The apartments are a great choice for families or groups. 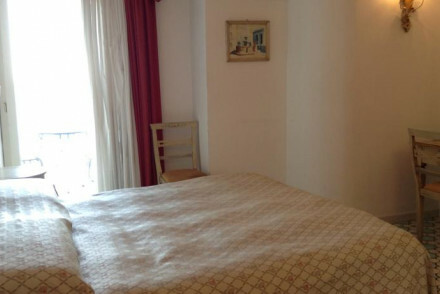 The bedrooms have warm terracotta floors, antique furniture and attractive bathrooms. The glassed-in terrace for breakfast is magical. The beach is a 210 step climb down. Families - The spacious apartments are the perfect base for families and groups, plus they're within walking distance of the beach. Great walks - Take a stroll through this charming town, wander the narrow streets and lanes to discover fantastic bars and restaurants. Sailing - Charter a boat and head up the Amalfi coast, a perfect day trip for couples or families. Local markets - The area around the hotel boasts many great shops, selling local wares. 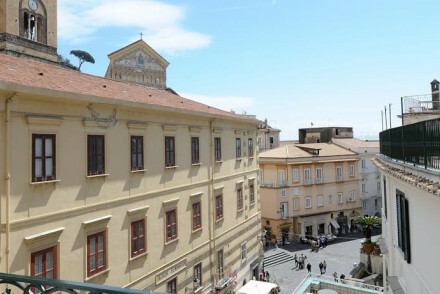 Superb boutique hotel with stunning views of the Tyrrhenian Sea. The rooms exude understated elegance with simple furnishings, tasteful artwork and fascinating antiques. 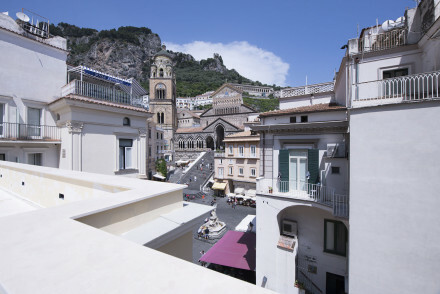 With a deluxe pool and an in house spa, it's perfect for a relaxing break on the Amalfi coast. Five star excellence. Great walks - Walking lovers will cherish the Path of the Gods, a spectacular walk from Agerola to Positano. Fishing - The hotel can organise sea fishing trips from Positano harbour. Sights nearby - Eight miles from the historic ruins at Pompeii. A smart boutique hotel with friendly staff. Picture-perfect views from the beautiful terrace and private balconies. Bedrooms decorated in whites, creams and pastels are utterly chic. The infinity pool provides a place of tranquility as it merges with the cobalt blue of the sea. A romantic spot. Sights nearby - Spend a day marvelling at the UNESCO Heritage Site Pompeii. A boutique property set against a cliff and offering glorious views of the Amalfi coast. A handful of rooms are classically dressed with tiled floors, simple furniture and pops of colour from the fabrics. Indulge in some of the numerous activities available or simply hide away in this tranquil spot. Hideaway - A small property overlooking the coast snd offering a totally secluded spot. Kayaking - Hire a kayak and explore the picturesque coast from the sea. Diving - Scuba dive from the Diving Center Amalfi Coast. 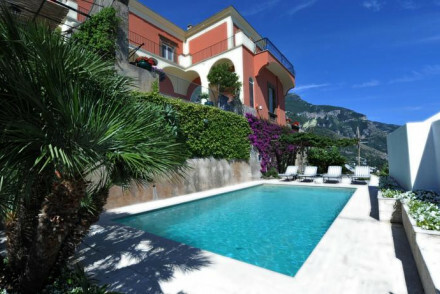 A beautiful Mediterranean villa in central Positano overlooking the beach below. Traditional and romantic rooms and suites with tiled floors, white washed walls, and private balconies. Excellent swimming pool and bar, restaurant, and wellness centre. Relaxation in a busy spot. 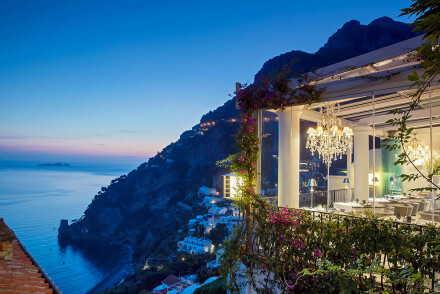 Truly sublime views of Positano and beyond from this 5* hotel's hilltop perch. 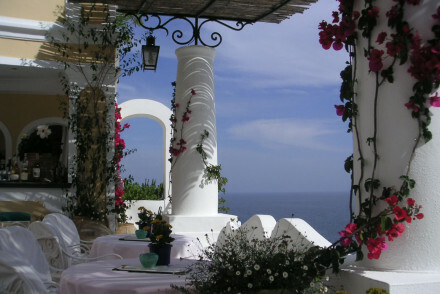 Romantic rooms in chic whites and creams with tiled mosaics and wonderful sea views from private balconies. The roof top terrace and swimming pool are equally magnificent. A great choice for romantics. Hideaway - A peaceful hilltop property, away from the crowds of the coastal strip, with clean cut suites and wrought iron balconies. Cooking classes - Take a master class in traditional cuisine with the hotel chef. Sailing - Experience the Amalfi coast in style on a speedboat. Sights nearby - Make a trip to the UNESCO Heritage Site Pompeii. A regal and romantic complex with out of this world views. The villa has beautifully manicured botanical gardens that sprawl towards the cliff face. Bedrooms ooze understated elegance, and there's a fantastic Michelin starred Mediterranean restaurant. Renowned as the ultimate wedding destination. Honeymoons - Perched on a sheer-sided cliff high above the Amalfi coast, with fragrant rose gardens, and romantic poolside dining. Great walks - Wander hand in hand through the stunnig gardens, the best time is early morning before they open to the public. Sailing - Take a boat up the coastline or to glamorous Capri, the perfect way to explore the coast. 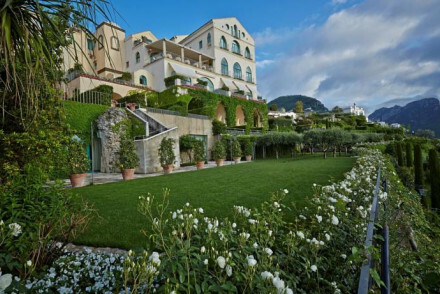 Film star luxury meets 1930s Italian glamour in classical Ravello. Spectacularly perched on the cliffs overlooking fishing villages below. Michelin star restaurant, stunning suites, sprawling terraces and lounge areas. Five Star in every aspect. Romantic Break - A perfect getaway for two, enjoy the suave suites with a glorious vantage point over the Med and pampering service. Foodies - Boasting a two-Michelin-star restaurant overlooking the sea and the more relaxed Terrazza Belvedere. Great walks - Leisurely strolls or more testing mountain trials, all come with stunning views. Sailing - Take a boat up the Amalfi Coast or to the glamourous island of Capri. A monastery renovated with romance and elegance. Its celestial views from its perch on a cliff top are to die for. The hotel captures the essence of la dolce vita with its location, understated but immaculate style, and its incredible spa facilities. A romantic destination. A perfectly typical Mediterranean property boasting glorious views over Positano and the bay. Individually styled rooms are mostly classic in style however the very best are recently renovated and contemporary. The rooftop pool is the real crowning glory, the perfect spot for a sundowner. Total relaxation - Offering fabulous sea views of the harbour. The swimming pool has a serious view too. This is a tough spot to leave. Sailing - Discover the coast of Amalfi and Sorrento on the hotel's own yacht. Sights nearby - Visit the Duomo in Positano, complete with stunning majolica dome. A stunning cliffside hotel with a private beach, a lovely pool terrace and restaurants. Chic interiors are light and breezy with stylish fittings and a fresh palette of white, blue and gold. Bright rooms with terraces have a blue palette, patterned fabrics and fun tiling. A real seaside gem! Spectacular Five Star hotel with all you could want for. Romantic bedrooms and suites with tiled floors, vaulted ceilings, sumptuous beds and private balconies. Private beach, restaurant, tennis courts, gorgeous infinity pool, spa and beauty salon. Very luxurious. A luxurious retreat in a stunning location. Beautiful rooms in whites and creams with splashes of colour and private balconies. Fabulous restaurants, private beach (reached by a glass lift through the cliff face) and luscious gardens with citrus groves. A tranquil and romantic spot. Beach Life - Guests ride an elevator down to a private beach and enjoy stunning seaviews from the property. Sailing - Book a private motorboat and spend a day exploring the Amalfi Coast by sea. Sights nearby - Visit the ancient towns of The towns of Pompei and Herculaneum. Views - Breathtaking views over the sea. 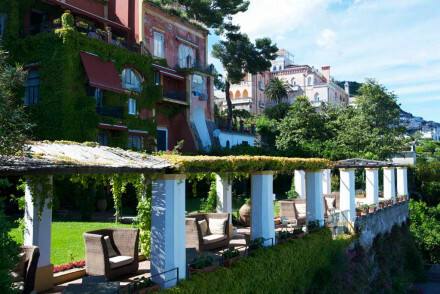 Stunning cliffside hotel with wonderful views and numerous terraces dotted with potted plants. Interiors are sleek and stylish with whitewashed walls and modern furnishings. Bright rooms offer great views from the balconies or terraces. Don't miss the spa and superb cuisine. Sheer romance at this family-run hotel in an 18th-century palazzo. A celestial Amalfian fairytale - heavenly bedrooms with private balconies, Michelin-starred restaurant, and a pool terrace filled with lemon trees. A magical spot for romantics and foodies. Romantic Break - A fabulous and sophisticated break for two, with sumptuous suites, black-sand beaches and sparkling sun terraces. 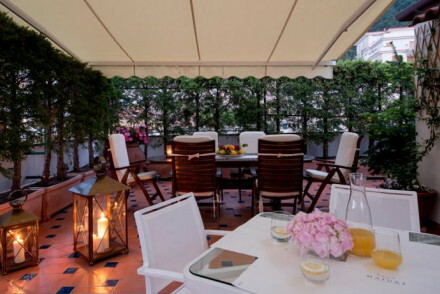 Foodies - La Sponda restaurant holds one Michelin Star and is lit every evening by 400 candles. Swimming Pool - Beautiful Outdoor Pool. With former guests including Greta Garbo and Jackie Kennedy you know you are in the lap of luxury. The infinity pool, suspended between sea and sky, is straight from the movies as is the al-fresco, restaurant. Hollywood glamour continues in the bedrooms with chandeliers, mosaic tiles and balconies. 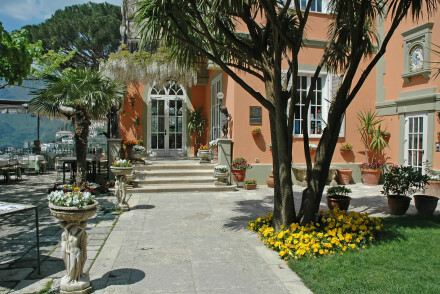 Great walks - Through the stunning Villa Cimbrone Gardens. Set on a cliff on the Amalfi Coast, Villa TreVille is an opulent estate with rooms and suites overlooking the Tyrrhenian Sea. Villas are adorned with ornate tiles and marble fittings, and guests have a private beach at their disposal. An Italian paradise with the atmosphere of a private home.